Well better late than never they say. This is my second post for today and my piece for the Stamp Man challenge. For this fortnight, as you can see, the theme is circles. I struggled with this one, Mr Mojo doesn't stay around when you are tired does he? And I lost some circle stamped pieces that Jill sent me to use - what am I like - honestly? My inspiration was Laura Liddell's tutorial on how to make your own craft resist card at Gingersnap Creations and the colour combo at Play Date Cafe. This was much more about technique than outcome. Next time I will try it on cream or white card to see the different effects. I also need to get some more large background technique stamps. Artist? Well I would like to think I'm getting there!! Please pop over to the Stamp Man Challenge blog to see the fabulous designs from the team and I hope you will participate. Don't forget that Jill gives a £10.00 voucher to the winner as chosen by the DT, well worth an entry don't you think? Jill has her new on-line shop going live this weekend and she now accepts PayPal as well. Hope your Sunday is going well. Thanks for stopping by today and thanks even more if you have been here twice. I love the background technique you have used. Definately alot of possibilities there. I know what you mean about your Mojo and being tired!! At work my head is buzzing with ideas but by the time I get a little time at night in my craft room, I find I hit the blank wall!! But when you are on your game - your work is amazing!! 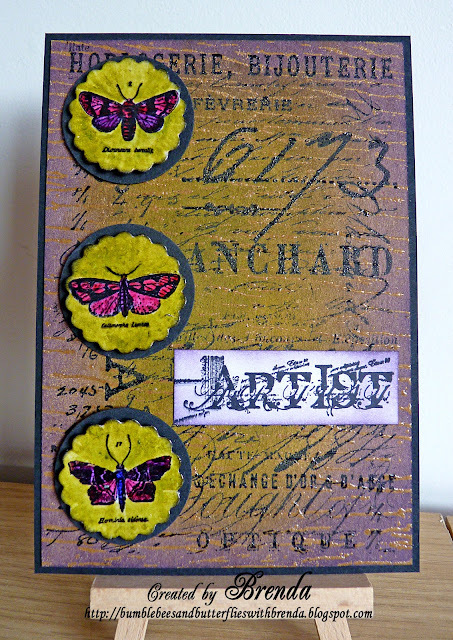 This is gorgeous Brenda and love the stamping and beautiful colours. Will have to investigate that technique too as it's a fabulous effect. Another wonderful piece of work Brenda. This does not have the appearance of someone who is tired! Love these colors and the stamping and background are oh so fabulous! The butterfly circles really pop! Have fun! So wonderful...thanks for all your kind comments....hope your weekend was great! This is brilliant Brenda,your definitely an Artist. Hi Brenda. Your background is really interesting. Yet another new technique to have a play at. I know exactly what you mean about Mr Mojo. It's hard when you must be so busy. He obviously wasn't too far away though as your finished project is lovely. Gorgeous creation Brenda, love the stamps and the colours really make this stand out. Fantastic card, love the bright colors of the butterflies. What a truly BEAUTIFUL take on this week's color story! I couldn't possibly pick a favorite element, even if I tried! LOVE! Thanks so much for playing along with us this week at The Play Date Cafe! What a delightful take on the challenge! SO PRETTY!!! It's tough trying to create on low energy, but I think you've done a great job!! Love how you've pulled it all together. So glad you could join in the fun with us over at The Play Date Cafe Challenge!